ATYRAU (KAZINFORM) A US $297.5 million loan agreement with the Japan Bank for International Cooperation and the Bank of Tokyo Mitsubishi UFJ was signed in Tokyo to construct a deep oil refining complex at the Atyrau Oil Refinery in Kazakhstan. 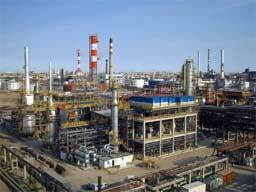 The construction project is the final stage of complete reconstruction of Atyrau Oil Refinery. This project is designed to process 2.4 million tons/year of raw materials (oil, vacuum gas oil). The contract for the construction of the oil-deep processing plant was signed on 29 December 2011 by Atyrau Oil Refinery and the Consortium, which included Sinopec Engineering (China), Marubeni Corporation (Japan) and KazStroyService (Kazakhstan). The cost of the project is US $1.679 billion. Project implementation period is 41 months. “The project will increase the depth of the oil processing at the refinery by 2016 to 85%. The volume of oil refining will reach 5.5 million tons per year,” General Director of the Atyrau Oil Refinery Talgat Baytaziyev said.